Still, need a little motivation? Check out these kayaking blogs to give you the inspiration you need. 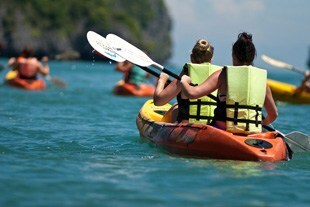 ‘Women power’ conquers the world of kayaking. Caroline Moon shares first-hand experiences to kayaking competitions in her blog – Charge 101. Caroline is a middle school teacher who loves to kayak, as much as she loves to teach Science. She writes about balancing life and career. Learn how to get the best of both worlds in your career and lifestyle. Any working woman should feel inspired. Her quality photographs are visible proofs of getting her message across. Celebrate life with Chris Baer Blog’s – Where is Baer as he keeps track of his travels around the world. He is a great story-teller. Keeping a good balance on talking technical details in searching for whitewater. His inspiring photographs are stories, and they tell us about the tales of his everyday activities. Chris Hipgrave posts reviews on the latest and newest gear for kayaking. These reviews are helpful to his followers in getting information on what may, or may not, work well. Chris uses his technical knowledge on his blog. Learn from his personal experience and advice. He also talks about surf ski competitions, for which he is also gearing up for competitions and kayaking. A Girl at Play is a company and blog headed by Anna Levesque. Especially created to allow women kayakers. Anna is a yoga teacher who loves kayaking. See her physical and emotional side as she posts celebrations on her achievements. Learn about yoga and paddling on her blog. Kayaking is a great exercise for both body and brains. A sense of achievement after each whitewater conquered. Reading these blogs should give you the kick you need to get out and go paddling. Their interesting stories should give way to whatever is holding you back. When you want to go kayak fishing, there are also kayak fishing blogs that will get you motivated. It’s time to get out that chair and hit the waters. Enjoy the feel of the adrenaline rush as you paddle your way past the whitewater.